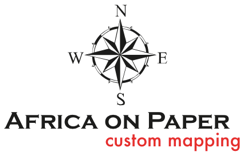 Africa on Paper produces attractive and effective custom maps for clients. We specialise in maps of African countries and have produced a number of travel maps. Should you be interested in having a custom map made for your company or of your country please contact us.